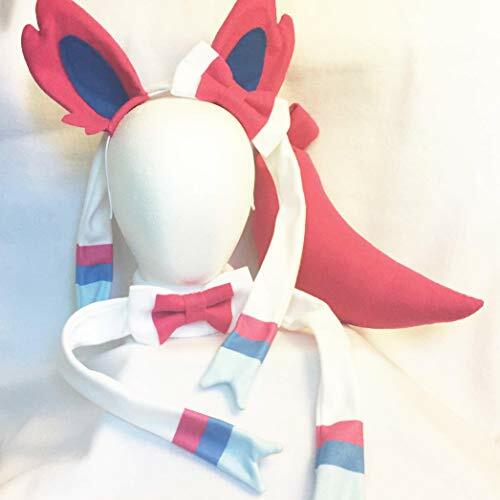 Handmade set of Sylveon Ears, Bowtie and Tail. You can select the whole set or each item individually. Please choose your desired option from the customization menu. Our costumes are comfortable and easy to wear, unisex and appropriate for both adults and children ages 3 and up. Ears are worn on the head with a highly flexible headband. Tail is stuffed/plush and includes a belt loop and safety pins. Bowtie sits on a soft fleece neck band adjustable up to 20" around. If you have any questions about this product by Panda Kitty Studios, contact us by completing and submitting the form below. If you are looking for a specif part number, please include it with your message.